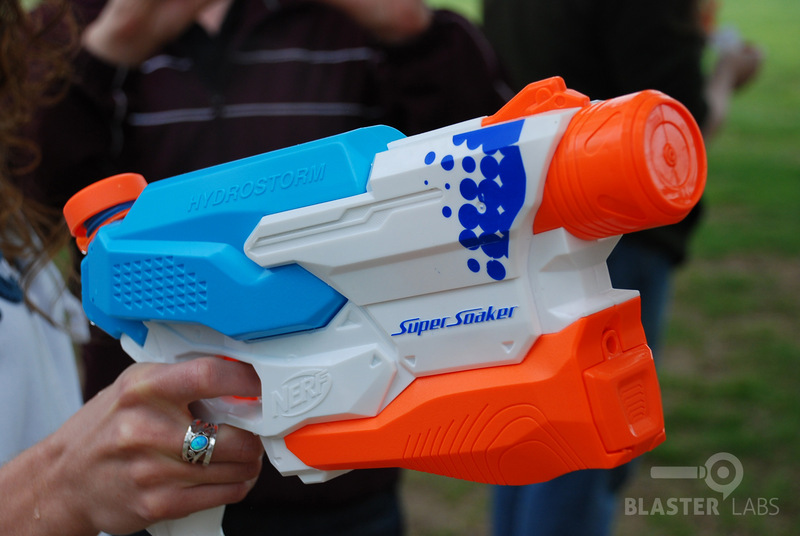 Our first impressions of the Hydrostorm were much the same as our first impressions with all current Super Soakers—good quality plastics, comfortable handle, solid feel. 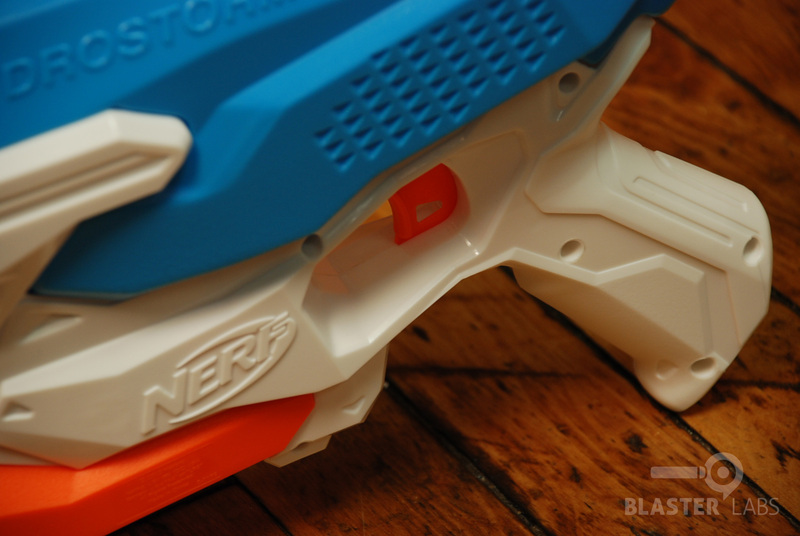 We’re still not gonzo over the current color schemes (the pastel blue of this particular blaster feels particularly weak), but it’s not offensive. And we give props to Hasbro for the fine surface detailing of their products and careful molding—it’s a noticeable difference versus competitors that use thin, shiny plastics that look and feel cheap. 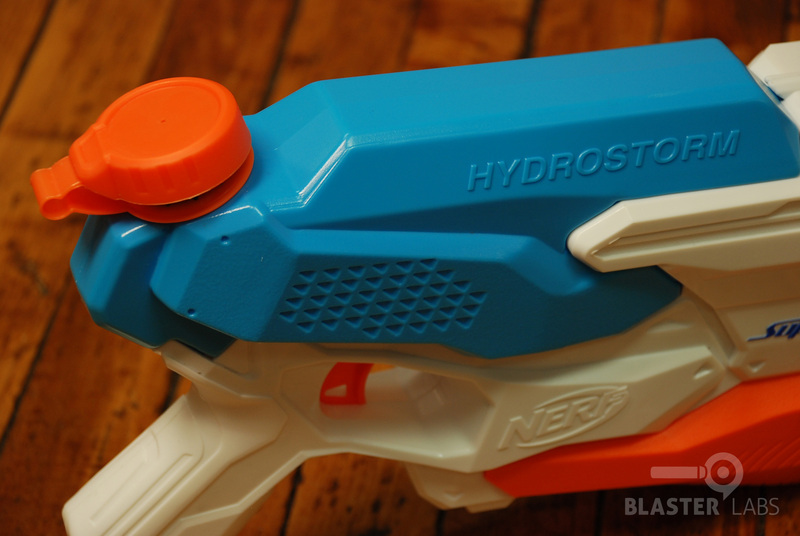 The Hydrostorm feels comfortable to hold, though the extra weight of the six (6) “AA” batteries in the fore-grip combined with the weight of the 25 oz. water capacity makes for a very hefty mid-size water blaster (one that is noticeably front-heavy, at least until the water reservoir is filled). 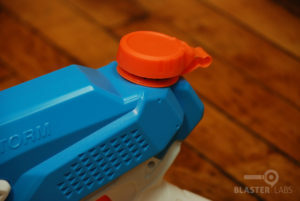 Filling-up the Hydrostorm quickly revealed the same design flaw we discovered in our review of the Double Drench—the tethered reservoir cap, though rubber sealed, has an air entry hole on top that does not have a valve to prevent leaking. So, under all but the most vigilant of circumstances, we were dribbling water all over our hands, the car, you name it. Wherever the Hydrostorm went, drips of water inevitably followed. And in some cases, those drips were actual streams. 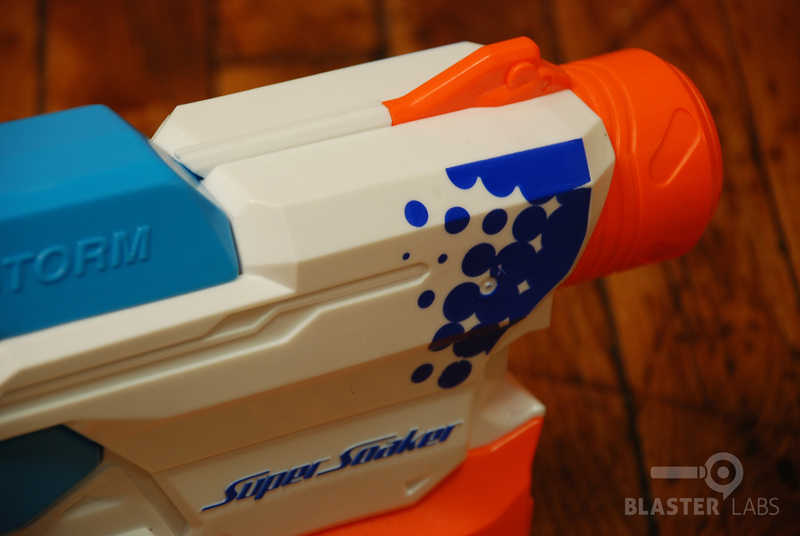 There was simply no stopping water from coming out the back if the Hydrostorm wasn’t perfectly level or tilted with the barrel down. To make matters worse, the threading of the cap became irreversibly mis-aligned, such that screwing the cap on correctly became impossible, further exacerbating the issue. 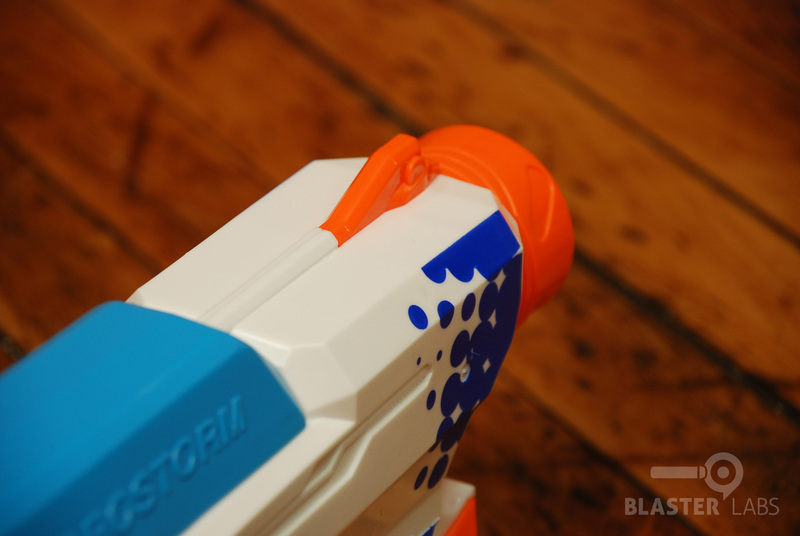 We also took note of a small hold in the bottom of the handle that other reviewers have suggested was for the evacuation of water due to internal leakage. We never had that particular problem, but the issues with the cap were enough as it was. 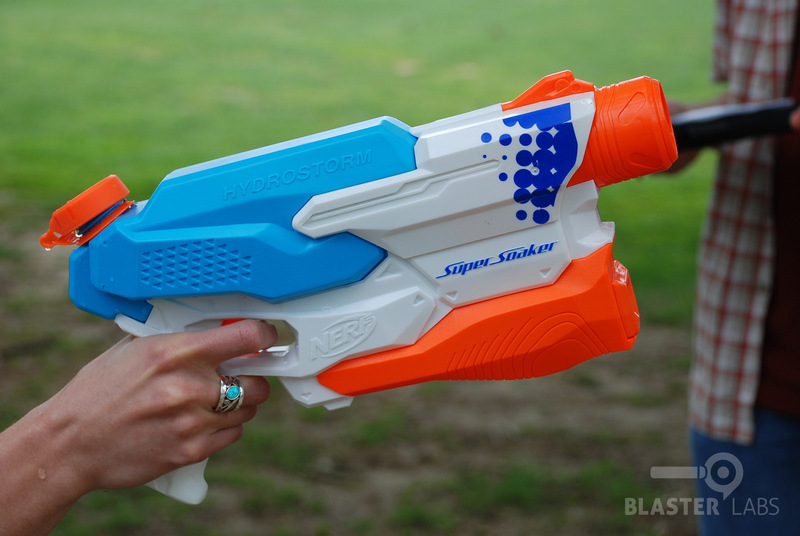 When playing with water guns, it’s expected that you’ll be getting wet. But the idea is to avoid getting any more wet than necessary—and with a limited water capacity, holding on to every ounce counts. Even in water warfare, “friendly fire” isn’t cool. 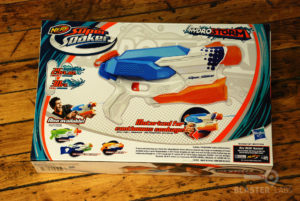 Nonetheless, we held on to hope that the Hydrostorm would redeem itself via its performance, and to some degree, it did. 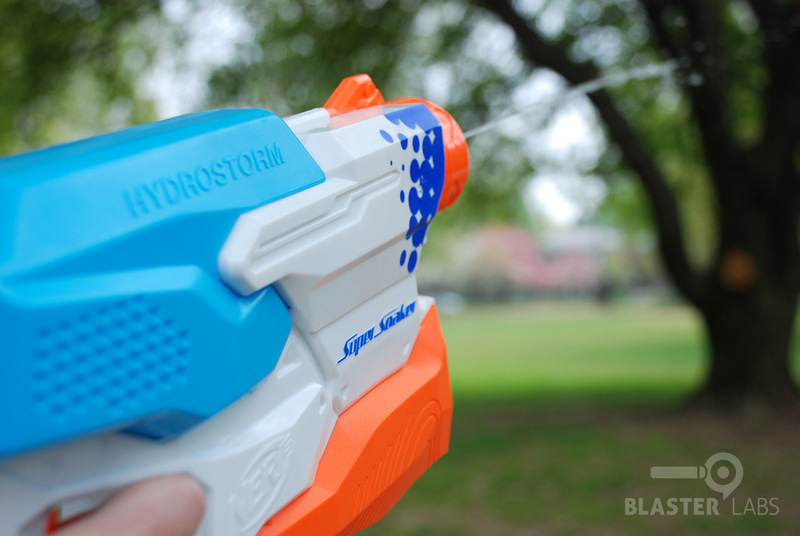 Unlike many motorized water guns that can barely reach 20 feet, the Hydrostorm reached solid, 29-foot distances in our tests. 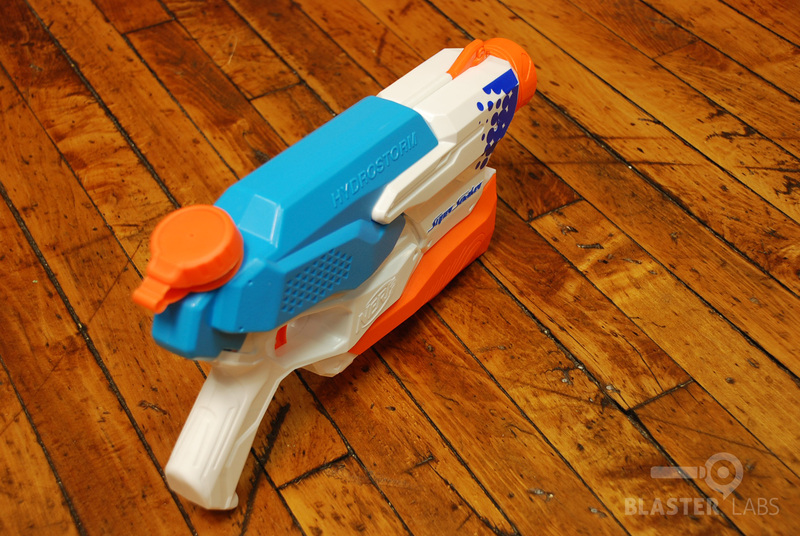 And it did so without any real effort on the part of the user—hold the trigger, and pulsed shots of 25 feet or more were assured, virtually every time. 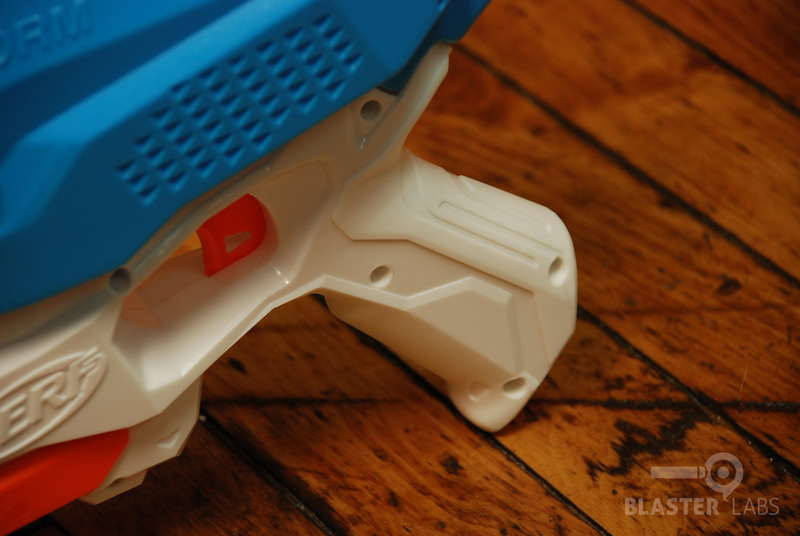 And speaking of which, we loved the fact that this blaster has an honest-to-goodness trigger! 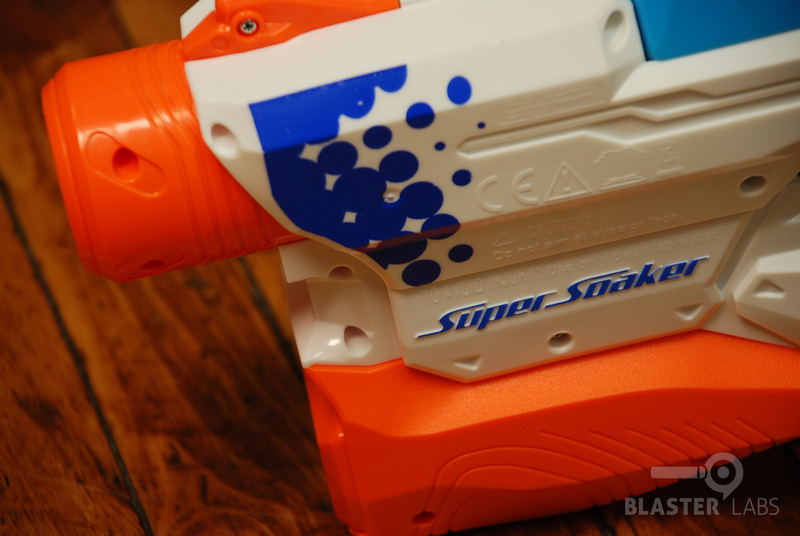 Yes, that’s expected of a motorized gun, but it’s so much more satisfying than pump-based action. 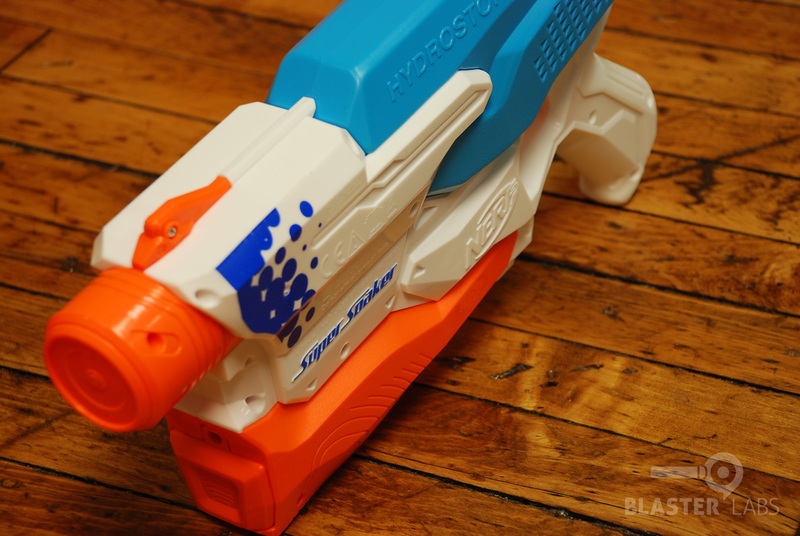 One performance aspect of the Hydrostorm that surprised us was the rate-of-fire. 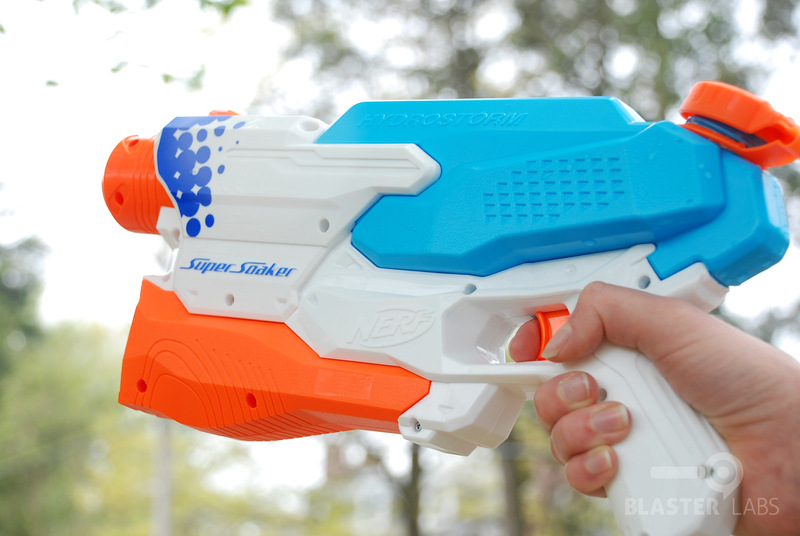 This water gun shoots fast! In fact, we had a very hard time counting the actual shots per second. 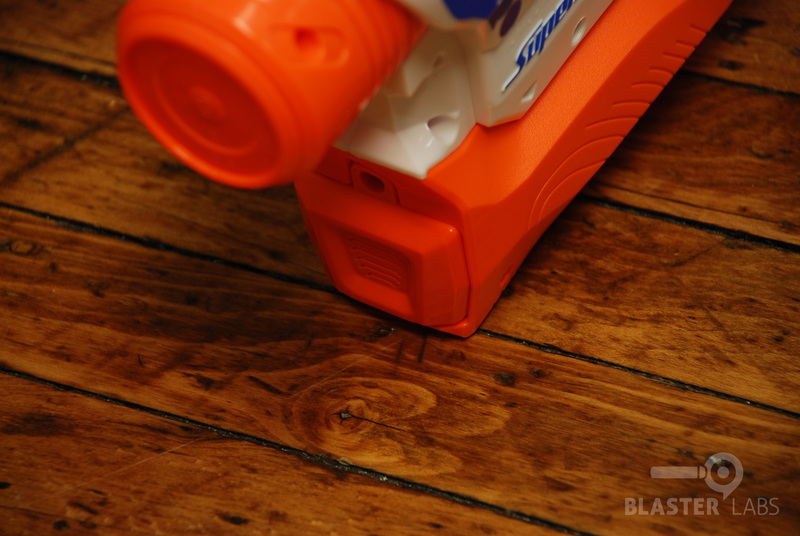 But by our estimates, we got about 30 shots in a 5 second period (or 6 shots per second). The downside of this is that the tank ran dry very quickly—under a minute with continued firing. In addition, the shots were both thin and short (in stream length, not range). 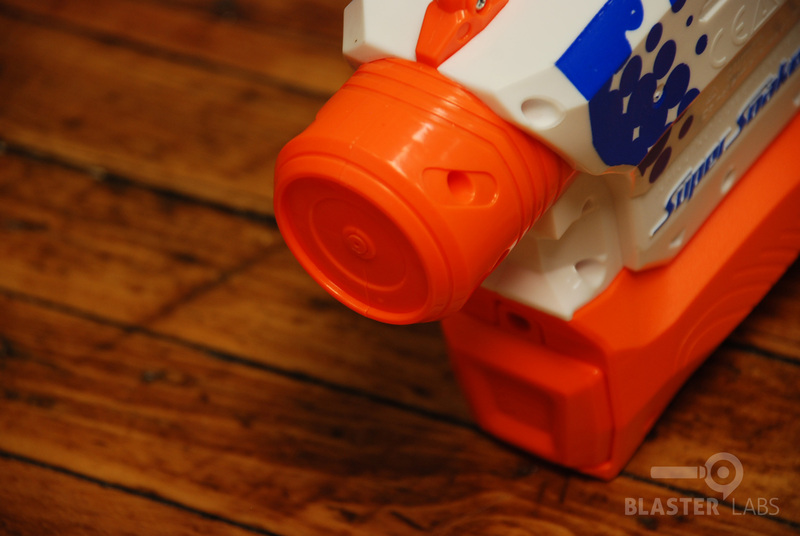 Air currents can easily alter the intended shot trajectory, though with so many shots being fired at a time, it was easy to re-align as necessary and give our target a good soaking. And we rather liked the pulsating nature of the rapid-fire motorization—it gave a tactile quality to the whole affair, not unlike the tiny recoil created by firing a flywheel-based Nerf dart blaster. 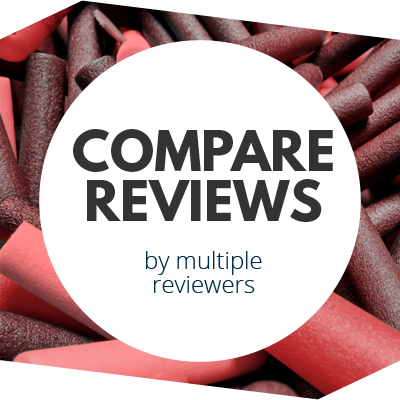 We had a generally positive experience with the Hydrostorm in our initial testing, but we would be remiss if we didn’t address the generally negative consumer reviews found online. 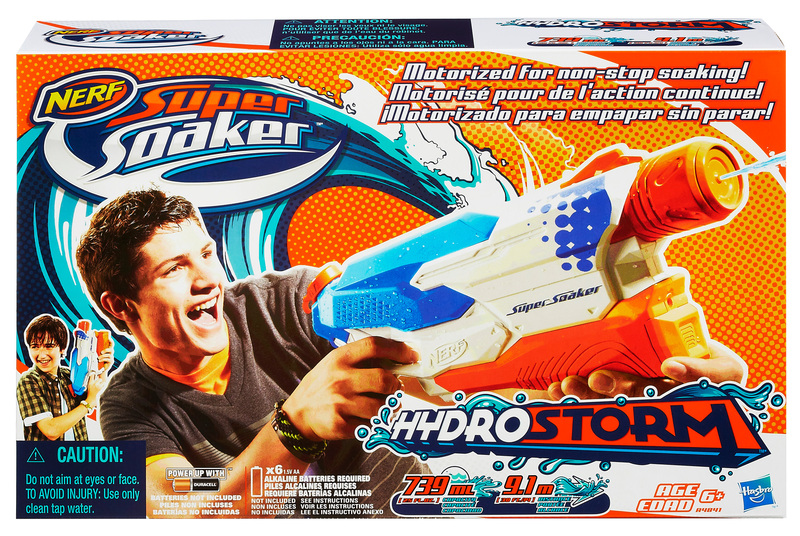 Though we didn’t experience any of the “stopped working” scenarios encountered by these consumers with their Hydrostorms, we nonetheless have to wonder if having so much leaking water around any kind of battery-powered apparatus wouldn’t eventually lead to an issue, particularly as younger users are likely to be less cognizant of these potential concerns. And the value quotient of a product that will require frequent swaps of 6 “AA” batteries is also questionable. 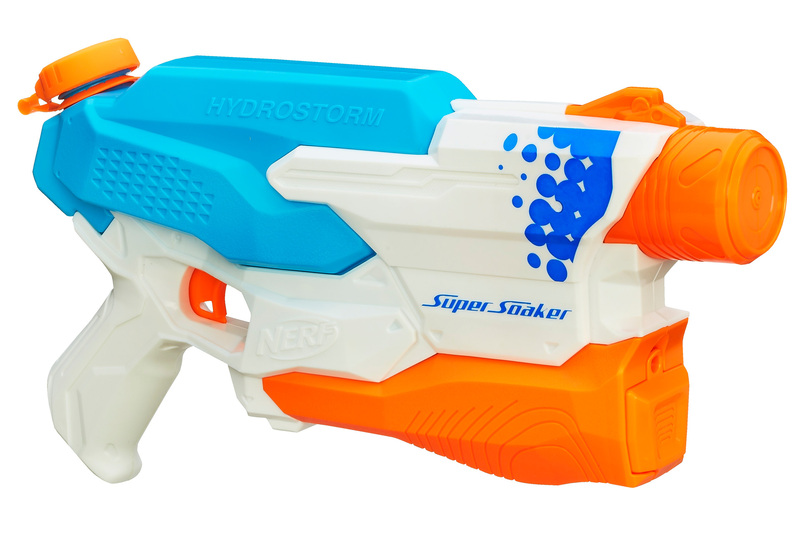 On the whole, the Hydrostorm is a solid upgrade to “Storm” line of Super Soakers, and one that proves motorized water blasters can at least hold their own in performance. 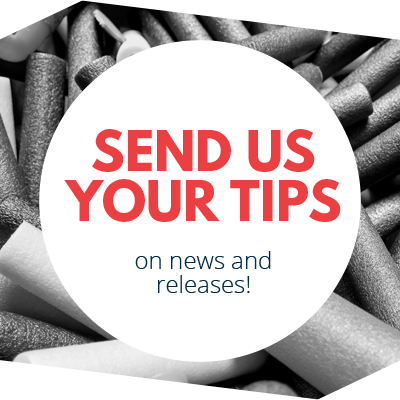 However, we do have concerns about the water leakage issues, ill-fitting cap, long-term reliability, and the overall value of a product that requires so many batteries. 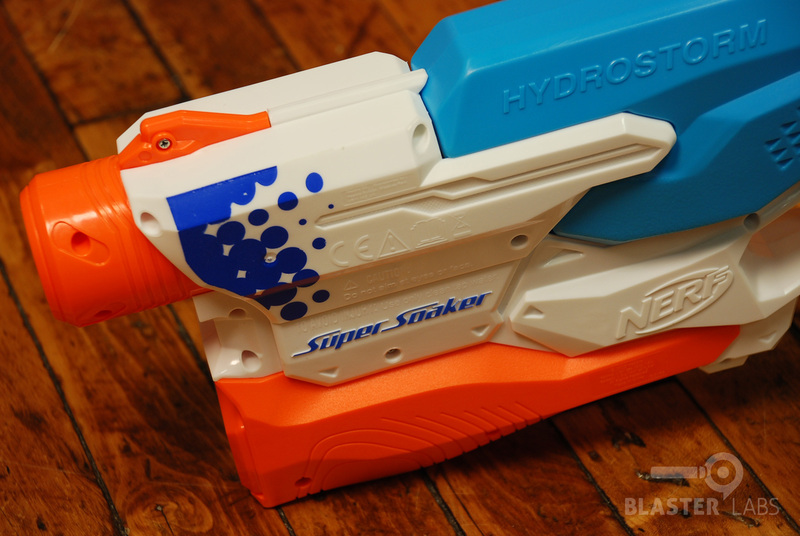 We also don’t think the Hydrostorm would fare very well against blasters that put out significantly stronger streams of water, if we’re looking at things solely from a performance perspective. 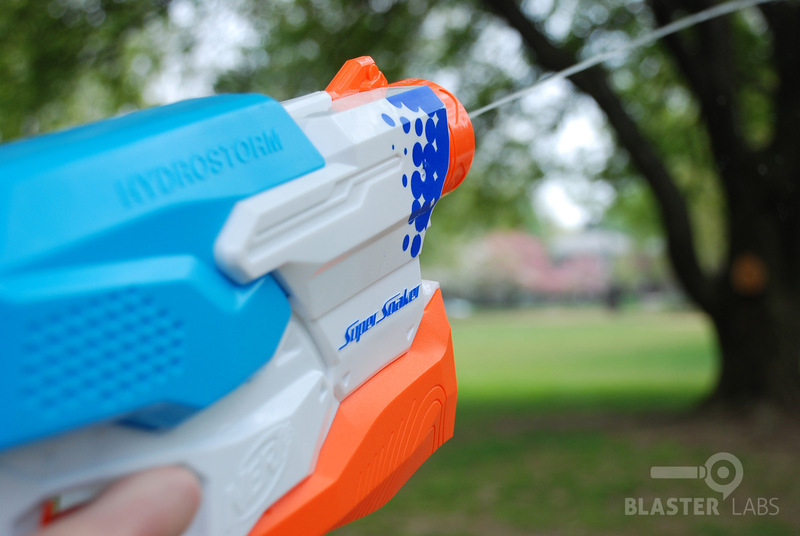 Still, we’re pleased to see the evolution of motorized water blasters continue, and look forward to future iterations that continue address this breed’s remaining issues.